to replace Justice Kennedy on the Supreme Court. VietPress USA (July 9, 2018): The CW39 Houston reported that "Kavanaugh was confirmed to his position on the Court of Appeals for DC on May 26, 2006, about 12 years ago. The 53-year-old worked in the Bush administration and also for independent counsel Kenneth Starr in the investigation that eventually led to the impeachment of President Bill Clinton. Kavanaugh has a history of conservatives votes in areas concerning presidential authority, the Second Amendment and religious liberty. However, some social conservatives — while refusing to go on the record — criticized two of his opinions: one dealing with the Affordable Care Act and a second about an undocumented pregnant teen who sought an abortion. “Throughout legal circles, he is considered a judge’s judge, a true thought leader among his peers,” Trump said. As he was introducing Kavanaugh, Trump said he didn’t ask the candidates for the Supreme Court seat about their political views. 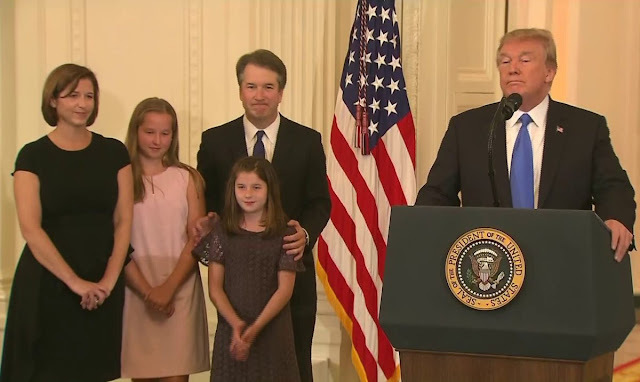 Today President Donald Trump officially declares his nomination of new Supreme Court Justice Brett Kavanaugh to replace Justice Anthony Kennedy who will retire since July 30, 2018. Brett Kavanaugh, a federal appellate court judge based in Washington, D.C., is his pick to replace outgoing Supreme Court Justice Anthony Kennedy — a nominee who, if confirmed, will cement a conservative majority on the nation’s highest court. Trump made the announcement from the East Room of the White House. Kavanaugh worked closely with independent counsel Kenneth Starr during the Whitewater investigation of President Bill Clinton. As documented in the latest episode of the Yahoo News podcast “Skullduggery,” Kavanaugh debunked the conspiracy theories that the Clintons were responsible for former aide Vince Foster’s death before becoming the primary author of the report laying out the case for Clinton’s impeachment. Kavanaugh was concerned with the more explicit sexual details of the report and attempted to redact them just before its publication. After assisting in George W. Bush’s efforts in the 2000 Florida recount, Kavanaugh joined the White House, first as a counsel to the president and then as a staff secretary. Bush nominated Kavanaugh for a position on the D.C. Circuit in July 2003, but his confirmation took nearly three years because Democrats contended he was too partisan for the federal bench. Kavanaugh was called an “unqualified judicial nominee” by the New York Times before his May 2006 confirmation on a 57-36 vote. In 2016, the conservative National Review wrote said that Kavanaugh’s opinions were “clear, consistent, thorough, and thoughtful” and had an “analytical clarity” that would make the late Supreme Court Justice Anthony Scalia proud. SCOTUSBlog, a news site about the Supreme Court, has described Kavanaugh as “generally bringing a pragmatic approach” to his decisions but with a conservative judicial philosophy. In analyzing him as a possible replacement for either Kennedy or Justice Ruth Bader Ginsburg, the blog Empirical SCOTUS said Kavanaugh would most likely be to the right of either Kennedy or Ginsburg on the court, but not as far to the right as Justice Clarence Thomas. In his time on the bench, Kavanaugh has declared the Consumer Financial Protection Bureau unconstitutional and ruled against Obama-era environmental regulations. Kavanaugh’s name being floated as a nominee has caused some infighting on the right, with one group stating that the judge was not anti-abortion enough in a case involving an immigrant girl requesting the procedure. Multiple conservative writers have defended Kavanaugh against this claim. According to the Associated Press, Trump reached a decision earlier in the day. Trump interviewed a total of seven candidates last week and on Monday narrowed his list of finalists to a pair of federal appeals court judges, Brett Kavanaugh and Thomas Hardiman, the New York Times reported Monday. The president had been considering two other judges — Amy Coney Barrett and Raymond Kethledge — before Hardiman emerged as a possible nominee on Sunday. But on Monday afternoon, both Barrett and Kethledge were at their homes on in Indiana and Michigan, hundreds of miles away from Trump’s primetime spectacle in Washington. 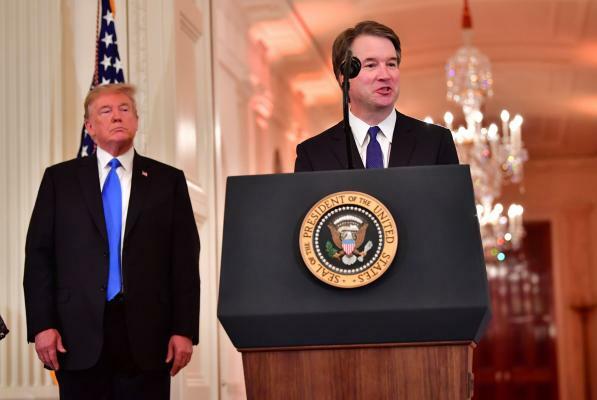 The announcement of Kennedy’s retirement last month sent shock waves across the nation, with Trump and his fellow Republicans poised to shift the court’s ideological balance to the right — and shape the country’s judicial future for generations to come. Abortion has emerged as a key issue in the looming confirmation battle, as Republicans hold a one-vote majority (51-49) in the Senate and need at least 50 to confirm Trump’s pick. Sen. Susan Collins, a Maine Republican who supports abortion rights, said last week that she would not support someone who would overturn Roe v. Wade, the landmark 1973 Supreme Court decision that protects a woman’s right to have an abortion. Collins and Sen. Lisa Murkowski, R-Alaska, were among five GOP senators who met with Trump last month to discuss the Supreme Court vacancy. Both are seen as key swing votes. “I look forward to Judge Kavanaugh’s public hearing before the Senate Judiciary Committee and to questioning him in a meeting in my office,” she added. “I am so disheartened that President Trump would choose such a radical, anti-consumer, anti-woman jurist to be his nominee for the Supreme Court,” Sen. Chris Murphy, D-Conn., said in a statement. Sen. Bernie Sanders, I-Vt., issued a similar statement. Dozens of protesters gathered outside the Supreme Court on Monday ahead of Trump’s announcement, and the size of the crowd increased immediately after. Size of crowd growing outside the Supreme Court.